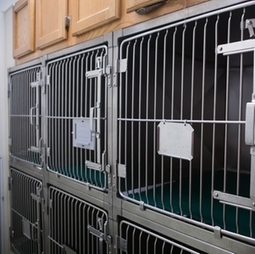 At the Care Center Hospital we offer in-house boarding for both cats and dogs. Our boarding kennels are spacious enough for large dogs and even housing siblings together. Dogs and cats are boarded in separate areas for a stress free environment. We provide bedding that is changed twice a day during their stay. We also provide food. However, if you prefer, you may provide your own. Dogs go outside in the morning and then again in the evening. We have large individual runs outside for your pet to play in during this time. Boarding facility hours are the same as the hospital. We do require up-to-date vaccine records on all pets staying with us. If desired, our doctors can examine and administer any vaccines needed upon request while they are here for their stay. The Care Center is the perfect place for your special pet to board safely while you are away. We have a medical staff available to give medication if needed or to provide a little extra care during their stay. Make sure to book early for the holidays as we usually fill up quickly!